Getting Started in Cowboy Fast Draw – What is it and how do you get started? 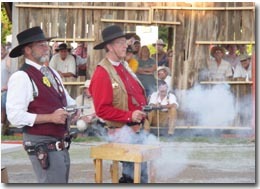 Cowboy fast draw is a relatively new sport having had its first World Championship in 2003. Created out of the imagination and dream of Brad Hemmah of South Dakota , it is a sport that shoots wax bullets and is fast, fun, competitive, and almost anyone can do it! If you want to feel like you’re part of the Old West, the excitement of standing on the shooting line next to your opponent, your hand shaking ready to draw at the first glimpse of the light in the middle of the target, and feel the adrenalin rush, this is the sport for you. With the average shooting times of top shooters being a little over half of a second and measured in thousandths of a second from the time the light has come on until they draw, fire, and hit the target, each shot fired is over in the blink of an eye! Many of the top shooters can do this in under half of a second and some even perform this feat in the high to mid three-thousandths (.330) of a second. Not to worry though, the faster the shooter goes, the more likely he is to miss and you have to hit the target to beat your opponent. I have seen many a top notch competitor lose to a shooter who is slightly slower but much more accurate. Most matches are elimination events, usually 4X, which means that you can lose four times before you are out of the event. The random drawing of the poker chips or computer determines who your opponent is, so you never know who you will compete against on the line. Young and old compete in these traditional fast draw events as the minimum age is 16. An 85-year-old even competed at the National Cowboy Fast Draw Championship in Meridian , Idaho in 2005. There are only two classes; men and women, though sometimes the host may give out additional prizes to the top seniors and juniors. New clubs are popping up all over and taking part in this traditional fast draw sport. There are different types of fast draw competitions and organizations. Cowboy fast draw has rules that restrict the use of guns and gun rigs to more traditional styles. The tricked out, heavily modified, fanning guns used in world fast draw competitions are not allowed, nor are the low-slung buscadero-type holsters you may be familiar with from shows likeBonanza and Gunsmoke. Such tricked out and modified guns can cost well over $2,000, while the fancy steel-lined holsters of world fast draw will easily run $350. You can get started in cowboy fast draw with a stock single-action replica for under $400 and a cowboy fast draw gun rig that looks good and works well for under $200. Naturally, as with any other sport, you can always go up in price and most competitors will want a little action-job performed on their sixgun. This is a great sport; it’s a lot of fun and filled with wonderful people. Come on out and try it and if you have any questions, feel free to contact us at (800) 342-0904, or send an email to info@shootmagazine.com. You can also contact the Cowboy Fast Draw Association at (605) 642-2573, cowboyfastdraw@mato.com, or visit the CFDA web-site atwww.cowboyfastdraw.com. Men and women only. The minimum age is 16. 1. Gunslinger: 15-feet from standing point to the target. 2. Gunfighter: 18-feet from standing point to the target. 3. Master Gunfighter: 21-feet from standing point to the target – All state, national, and world championships are conducted at 21-feet. The only firearms allowed for this sport are stock single-action sixguns with a minimum barrel length of 4-3/4″ chambered in .45 Colt. “Stock” means that you can’t replace the barrel or cylinder with a lighter one or replace the standard hammer the gun comes with, with a different style. You can give the gun an internal action-job but can not do any external or frame modifications. Gun rigs need to have a traditional style to them. Metal, kydex, or other stiff lining of the holster or belt (except leather) is not allowed. The top of the holster can be no more than 3″ lower than the top of the belt. The cut out in the front of the holster can be no more than 1-1/4″ from the cut to where the hammer meets the frame of the sixgun when the sixgun is in the draw position. The angle of the holster can be tilted no more than 20°. Tie down straps are not allowed, though tie down thongs are. A small, external, metal plate at the bottom of the holster is allowed to protect the leg if one accidentally shoots through the holster “boot”. Traditional western wear is recommended, but standard jeans, cowboy boots, and straw cowboy hats are accepted. Tennis shoes and baseball caps are not allowed. For ideas on clothing, visit the Shoot Mercantile or browse through an issue of Shoot! Magazine. The targets are made of steel, usually 1/16th of an inch thick and are 24″ in diameter with a 3-1/4″ round circle of clear lexan or similar material in the middle of the target behind which is placed a light connected to the timer. A metal box is placed over the light for protection. Either a standard 40-watt light bulb is used requiring a power cord, or more recently a LED light system has been used which also connects to the impact sensor unit and has a sensitivity adjustment in it. The sensor unit is usually a small box with a ¼” telephone jack. The center of the target must be located at 50″ above the ground. Targets can be made locally or are available on the Shoot! Mercantile (targets are sold separately and without sensors or LEDs). Bullets are wax, usually of a proprietary mixture. Two excellent wax bullet manufacturers are C&R Wax owned by Ray Thielke (541) 575-4241 , oregondrifter@hdni.cc, www.gunfighter.com/waxbullets, and Bandit Supply owned by Don Valle (605)255-4509 , cdranch@peoplepc.com. Both of these business owners are also excellent cowboy fast draw shooters, so they know what their product should do. The brass used is normally .45 Colt Blank Brass which has a larger flash hole for the primer than normal brass so that primer backout is less likely. This brass is available from Top Brass (719) 539-7242 , www.scharch.com, and Starline Brass (660)827-6640 , www.starlinebrass.com. Special nickel-plated brass that use shotgun primers is also available from CFDA or Shoot! Magazine. This brass is primarily used for practice by just slipping a shotgun primer in the primer pocket and pushing in a wax bullet in the top of the case. It is easy to use, but depending upon the amount of head space available can lock up the cylinder when a primer backs out. Powder used is black powder such as GOEX FFF or a black powder substitute such as Hodgdon’s 777. Many people will just use large pistol primers without primers for practice. This works well but you should clean the barrel of your gun after every 10 shots as the wax tends to build up and you could get a wax bullet stuck n the barrel. The recommended amount of powder is five to six grains of black and four grains of 777 which produces higher velocities. A 15-grain wax bullet with four grains of 777 behind it will attain velocities of 825 feet per second. The timer of choice is currently made by Shooting Electronics, Inc. and is available through Shoot! Magazine atwww.shootmercantile.com. This timer is a duel competition timer that uses LED lights running on a single CAT 5 cable that also connects to the impact sensor through the LED and can run on batteries. It will also function with Beamhit’s laser system with additional LED laser unts. This new timer has replaced the Fast Track timer which uses a standard power cord, 40-watt light bulb, and a sensor cable which had essentially been the only one available up until the spring of 2005. Safety is always the most important aspect of any shooting sport, regardless of what type of projectile is being shot. All safety considerations that apply to standard ammunition should be followed. If a wax bullet hits someone in the eye or throat, it could have very serious consequences. Hits in the leg, which may occur when drawing too fast, can also be painful. Guns should only be fired when pointed safely down range. Heavy pants or skirts should be worn and chaps are even recommended. Boots are a must to protect your feet. Wax bullets sometimes bounce back and they shouldn’t hurt if they hit you in the body, but you don’t want them to hit you in the eye. Eye protection must be worn at all times and ear protection is certainly recommended. Shooting areas should have adequate backstops and side walls to protect spectators. This is a sport that can be set up and shot in the middle of downtown as long as appropriate safety precautions are taken. Events are conducted all across the country. They could be sanctioned exhibition events or CFDA sanctioned match events. You must be a current member of the Cowboy Fast Draw Association to participate in a sanctioned event for which a minimum of 1/3 of the total prize package is supposed to be provided in cash. The announcer controls the match and ensures that the range officer, score keepers, hand judges, and participants are ready. Competitors stand next to each other. Upon command they are allowed to load up to five rounds with an empty chamber under the cylinder and holster their revolvers. You may put your hand on the gun to get ready wth your thumb on the hammer, but your trigger finger must be outside the trigger guard alongside the holster. The commands: “Shooters on the line”, “Shooters (pause) set”, are given. Upon the word “set” the timer is activated. There is a two to five second delay before the light in the middle of each competitors target comes on. You must wait for the light to come on before you draw, otherwise you may be called by your hand judge. The person who hits the target first wins that shot. It normally takes the best three out of five to win that round, though sometimes a two out of three match or portion of a match is conducted. When you have lost a round you receive an X. Primary contests are usually 3X or 4X contests while many secondary contests are 1X contests.